For our most recent issue, we sat down with author, musician, and educator Vivek Shraya to discuss her writing, her career and her imprint at Arsenal Pulp Press. Her most recent publication, “I’m Afraid of Men” is now available for purchase from Penguin Canada. Sections of the interview were condensed and altered for clarity. Who are your literary and musical idols? For interdisciplinary artists, I look to Beyoncé. She’s someone in popular culture that I think is doing an incredible job of melding genres¬, especially with Lemonade or the visuals she puts together for her announcements, whether it’s her pregnancy or a tour. Musically, I’ve been listening to a band called H.E.R., that’s what’s on my spotify playlist right now. Literary-wise, I’m really inspired by Michael DeForge, a graphic comic artist with Drawn and Quarterly. Graphic novels have always intimidated me a little bit, but he’s a writer and illustrator that really got me into the genre. His stories blow my mind because I never know where they’re going to go. The most exciting art for me is art that’s unpredictable. I always wonder what it’s like living in his brain. You’ve done work in lots of different genres and mediums, from graphic novels to pop albums. What’s your favourite medium to work in? In the past, I probably would have said music because it’s the genre that I started working in first. I’ve been writing songs ever since I was a young teen in Edmonton. But increasingly I’m loving being a multidisciplinary artist and jumping between genres. I’m excited about the possibilities of what you can say and can’t say in different genres and I’m pushing back against those limitations a little bit. You have a non-fiction book entitled “I’m Afraid of Men” launching in August 2018. What can readers expect from this work? It’s a single essay, kind of in the style of Chimamanda Ngozi Adichie’s We Should All Be Feminists. The book is me exploring my relationship with masculinity as someone who was pushed into masculinity as a teenager, then adopted masculinity in my twenties, then pushed against masculinity in my thirties by coming out as trans, and am still having to encounter the fear of masculinity. As a trans girl, I feel that I have experienced and have had a relationship with masculinity from a variety of perspectives, so this book is unpacking masculinity utilizing those perspectives. 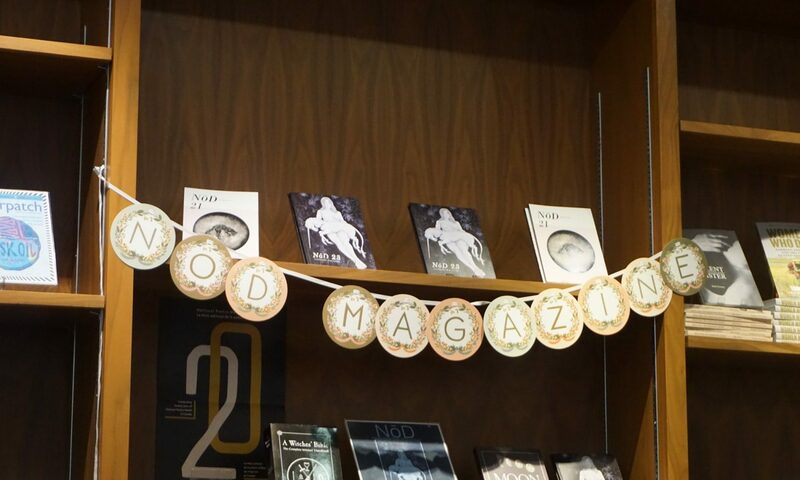 How do you think literary magazines fit into Canadian Literature? How can literary magazines become a force for progress instead of upholding the norms of CanLit? Truthfully, it’s a medium that I haven’t explored a lot as a writer. I came into writing by self-publishing my first book after feeling frustrated at not being able to make my music career happen. It’s difficult for me to weigh in on the roles and responsibilities of literary journals. That being said, publishing in literary journals is often what book publishers look for in emerging writers. That was something that I didn’t have which made it harder for publishers to take a risk on me. I wasn’t eligible for a lot of grants because they look for “formal” publications in a literary journal or in book format. So I’m in a better position to weigh in on the limitations of what we imagine professional writing to be. In my case, I had self-published a book called God Loves Hair that was being used in post-secondary institutions as a textbook and was nominated for a Lambda. Despite the book’s success, I still wasn’t seen as a professional writer because I hadn’t been published by a literary journal or because an official publisher hadn’t published the book. I was even asked to be on juries for awards that wouldn’t consider self-published work as legitimate forms of publishing. My opinions were valid, but my books were not. So I think that there need to be more accessible ways into publishing that aren’t just those two mediums. It seems a little bit backwards to me, because I only started getting invitations to submit to literary journals after I’d been published by Arsenal Pulp Press, even though I’d been writing and touring for four years with God Loves Hair. It’s interesting how insiderness perpetuates insiderness. The opportunities exist once you’re inside, but how do you get in when you’re outside? I’m a huge champion for self-publishing. I don’t think that self-publishing is for everybody and I definitely recognize that I had a certain amount of class privilege that allowed me to put it on my Visa, but there are more affordable ways to self-publish now. At the end of the day, I sold two thousand copies of God Loves Hair without a manager, a publisher, or a publicist, so it can be done and there’s an audience for it, despite what mainstream publishing says. There is an audience that is hungry for work that isn’t just being published by publishers. You recently released an album with your band Too Attached called “Angry.” What makes you angry about the current CanLit and Canadian music scenes? When I started in the literary community eight years ago, it’s not that conversations about race, diversity, gender and sexuality weren’t happening, but those conversations weren’t distributed in the mainstream. Now, especially because of social media, specifically Black Twitter and Indigenous Twitter, the conversations around the need for better forms of representation are a lot more public (both in the music industry and in the literary industry). Racism in both industries also feels a lot more public than when I was starting. I think that there’s a realization that you can be applauded and congratulated for talking about and championing diversity publicly. It’s become a form of cultural cachet; when you start digging a little bit under the surface in terms of tangible action, it makes me wonder about the outward social action of championing diversity versus actual intersectional change. A lot of this feels performative and that feels harder to challenge. The other thing I’m angry about is the commodification of diversity and I certainly benefit from that. I keep hearing from people in the industry that “diversity is really important right now” and it’s the “right now” that really causes me anxiety. What happens when diversity stops being a trend? But also, what does it mean for organizations and institutions to be looking at diverse writers not as writers that have very important things to say, but as ways to check off their boxes? It’s been said that you’re spearheading the next era of CanLit culture, who do you see coming with you and what can we do to support these authors/musicians? I think some of that work is being produced right here at the university and in Alberta from authors like Joshua Whitehead and Billy-Ray Belcourt. Their work is so exciting and vital. Musically, I’m really excited about an artist named TiKa from Montreal and Kamilah Apong. The best thing that people can do if they like an artist is buy their work. That especially helps them fund their projects if they’re independent. I personally feel so indebted to that kind of support. If you can’t support artists in a commercial way, there are other ways to support like social media, following artists you like and retweeting their posts. I think sometimes people don’t realize that popularity and visibility online are tied to cultural capital. When music bookers are deciding whether or not they want to bring you to their festival, they go to your Facebook page and see how many likes you have. It seems like a superficial ask, but it can make or break whether or not you’re given opportunities as an artist. Even borrowing from the library is a way to support artists. Writers are given a small form of royalty based on how often their books are taken out from the library through public lending rights. If you can’t afford to buy work from writers or musicians, there are always other ways to support them. You’ve written two books for children and young adults, do you have any plans to write more children’s literature? What issues do you think children’s literature should be confronting? I really like children’s picture books as a medium. For me, writing The Boy & the Bindi was tied to representation. I was actually on a jury looking at children’s picture books and was disturbed at how few of them were by writers of colour or featured children of colour. Despite the progress and conversations about diversity, we’re still in a cultural moment where it’s still easier for us to talk to children about difference using trucks, vegetables and animals than it is to actually feature children of colour. I was so frustrated that I wrote The Boy & the Bindi J. K. Rowling-style on a napkin. I feel passionate about more children of colour in children’s picture books, but also from an intersectional lens, having gender, sexuality and race in children’s books. There are a lot of LGBTQ picture books, but again, a lot of them feature a white child and I’d like to complicate that a little bit more. It is a genre that I’m excited about because of its limitations. It’s kind of like a pop song in that you only have so much space and you have to figure out how to use that space effectively. With children’s literature, you can actually witness change in children and hear stories from parents—that’s where change really needs to happen. The biggest frustration about education around bullying, homophobia and transphobia is that these conversations aren’t happening at younger ages. As a political device, I think that children’s picture books are unprecedented in their potential. We’ve been taught to see mythology as a negative thing because of its patriarchal roots, would you consider “I’m Afraid of Men” to be a deconstruction of myths around gender and toxic masculinity? With a title like “I’m Afraid of Men,” the deconstruction sort of happens in the title. It really frames men as something to be feared, and so I feel that the work of the book is less about deconstructing myths and more about unpacking the range of ways that fear occurs. I think that women and feminine individuals experience and manage their fears in ways that are so subtle and innocuous that we don’t even realize until we start listening. For me, I think the work of deconstructing the myth happens right at the beginning, and from there it’s about deconstructing fear. This issue of NOD addresses ritual; you often write about cultural rituals and how they tie into self-presentation. Why do you think ritual is so significant in your work? I grew up with a Hindu upbringing and it doesn’t get a lot more ritualistic than that. God Loves Hair explored the way that Hinduism was practiced in my religious community (which was very non-denominational) and how this kept me safe as a young gender-creative kid. The dominant narrative we hear are the ways that queer or trans individuals and teenagers are oppressed by their faith or religion, are vital stories, but there are other stories to be told as well. I had space to sing and dance in a religious context and these rituals actually made me special in my community, whereas in school they were seen as “faggy” and abnormal. If anything, my religious context really nurtured my artistic practice. Despite being an atheist now, I feel like I was exposed to the beauty of ritual at a very young age and I keep coming back to the ways that ritual can still be mobilized outside of religion and religious community. The Boy & the Bindi is not tied specifically to religion, but the ritual of a boy watching his mom put a bindi on. Then, her passing it on to the boy becomes this beautiful gesture of family acceptance and self-acceptance. What has it been like joining academia? How has your approach to your work changed since joining academia? Coming into academia as an artist, I do feel imposter syndrome. The number one question you get asked in academia is, “What is your research in?” As an artist, that’s not necessarily how my brain is wired. Aside from that, I really love the teaching. It feels like a really beautiful extension of my art practice. I get to go into a classroom and take ideas and politics that I care about and share them with students who may or may not be interested, but are open to listening. That’s so much of what my art practice is about, taking a politic or an idea and turning it into art, whereas in the classroom I’m taking an idea or a politic and turning it into (hopefully) a riveting lecture. There is also something about teaching that feels performative, which is something I have experience with. I feel really fortunate and privileged which comes with a certain element of accountability. In teaching a genre like science fiction, which my art hasn’t formally engaged in, I’m definitely imagining science fiction featuring in future works as well. I am passionate about making space for and supporting other emerging writers. Last year, I launched my own imprint through Arsenal Pulp Press called VS. Books and it is to support one BIPOC writer between the ages of 18 and 28 as a mentorship in any genre. We work together for a year until their book is published. Last year, I selected a writer by the name of Téa Mutonji, who is writing the imprint’s first book coming out in spring 2019. We’ll be opening submissions for this year in April. And so that time of year begins! We’re excited to be officially open for submissions for any and all prose, poetry and/or creative artwork that you’re itching to share. This upcoming issue will be unthemed. You do not need to be a part of the University of Calgary community to publish with us, but we especially encourage University of Calgary undergraduate students to submit! Submissions will close October 5, 2018 @ midnight. Feel free to read some back issues and pieces on our blog to get a glimpse for the kind of work we crave. You can order back issues on our tictail shop! Check out our official submission guidelines here and send your best work to nodmagazine@gmail.com. We can’t wait to see what you put forward!